General view - Dumgoyach Hill in background. 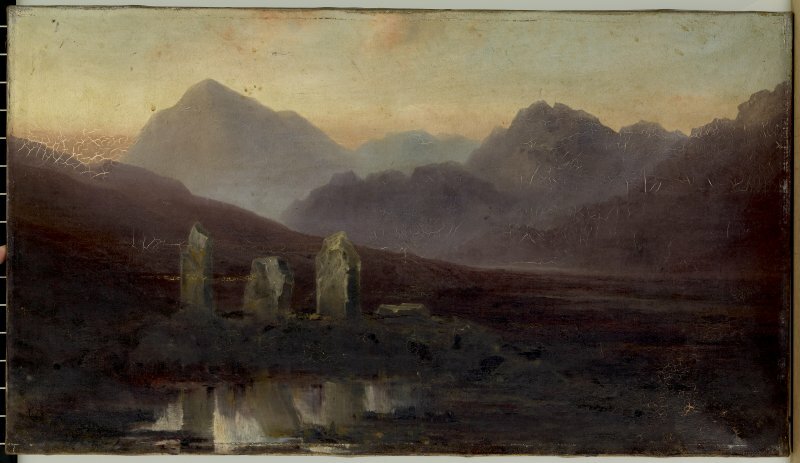 Publication drawing (sketch); standing stones, Dumgoyach. Oil painting showing general view of Dumgoyach stone row. 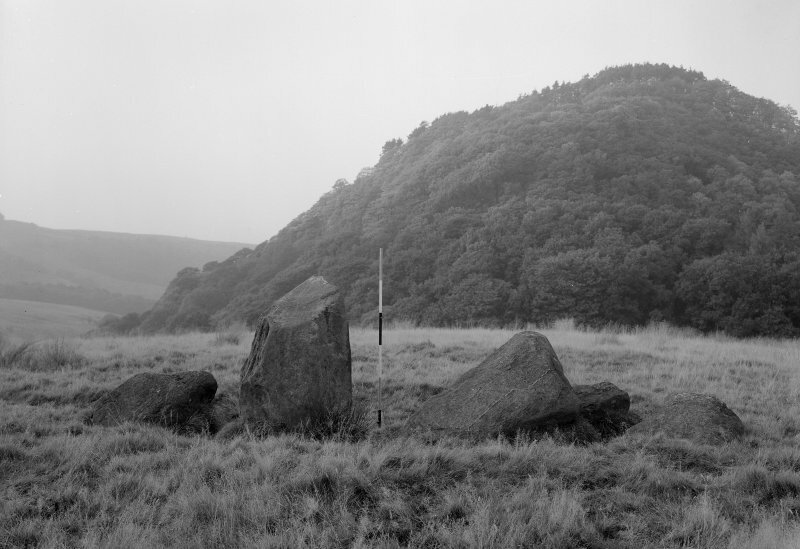 There are five standing stones (A-E) arranged in a straight line from NW-SE on the highest part of a broad ridge running SE from Dumgoyach. Three of the stones (A, B and C) are earthfast, while the other two (D and E) are recumbent. Stone A is of irregular shape and leans steeply towards the N. The exposed portion measures 4' in height, 2'6" in breadth and 1'2" in thickness. Stone B stands upright, 6' NE of A. It is a pillar of roughly rectangular section with an irregularly pointed top, and measures 5' in height by about 2'6" in thickness. Stone C, also irregular in shape, 11'6" NE of B, is inclined so steeply to the NNE that it is almost recumbent. It measures 4'4" in height, 2'6" in breadth and 1' in thickness. 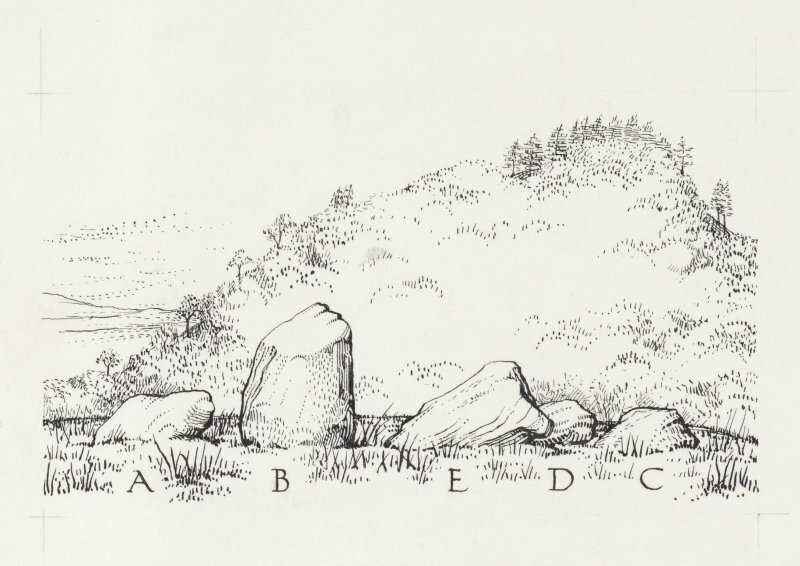 The remaining two stones lie on the ground between B and C. Stone D measures 5'5" in length, 3' in breadth and 1'6" in thickness while stone E, which rests partly on D, measures 7'10" in length, 3'9" in breadth and 3' in thickness. These stones are as described by the RCAHMS (Except that the orientation is NE-SW). Visited by OS (R D) 19 August 1966. A resistivity survey and excavations were carried out at this site. Four clear layers were observed in the sections, from topsoil to subsoil, and a flint core and some flakes were found in the top two. On top of layer 3 were several spreads of a white ashy deposit containing flecks of charcoal. A radiocarbon date of 2860 +/- 270 B C (GX-2781) was obtained. The socket for the one remaining upright stone was cut through layer 3 but layer 2 appeared to have accumulated against it. The level of the hearths therefore seems to be associated with the stones. The stone at the SW end of the line, which lies flat, may be a recent addition to the group. NS 532 807 This setting of standing stones originally comprised four stones aligned from NE to SW; two field-gathered boulders have been added in recent times. A radio-carbon date of 2860 +/- 270 bc obtained from the setting suggests that it was erected in the Neolithic period.